A drone flies outside of the Aeryon Labs Inc. headquarters in Waterloo, Ontario, on April 14, 2016. (Bloomberg photo by James MacDonald). The defense giant is partnering with the Drone Racing League on a competition to develop artificial intelligence algorithms that can beat human-piloted drones. When an IBM computer beat grandmaster Garry Kasparov at a game of chess in 1996, it was hailed as an unexpected, perhaps foreboding, victory of machine over man. Two decades later such victories are commonplace, with artificial intelligence now capable of everything from picking stocks to driving cars. Could aerial navigation be next? To find out, defense contractor Lockheed Martin is partnering with Drone Racing League, a racing competition for drone enthusiasts that airs on ESPN, to offer a total of $2 million in prize money for an artificial intelligence algorithm that can navigate better than a human-piloted drone. 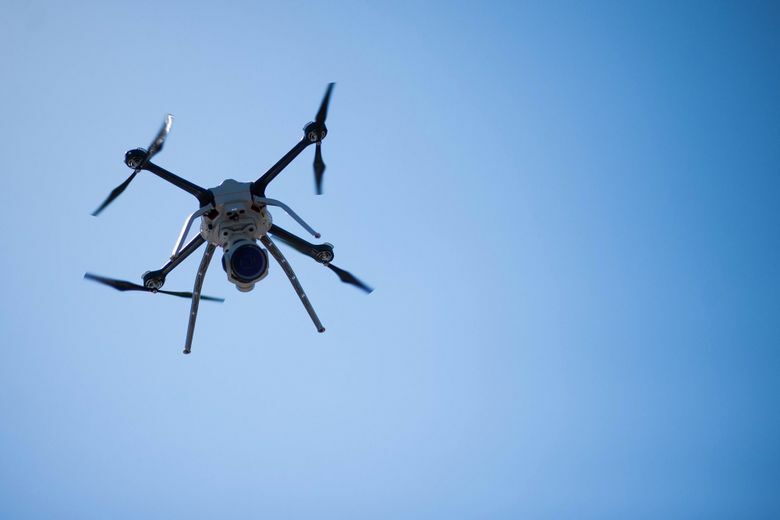 The two companies said they will recruit engineers from universities and elsewhere to develop software that can steer through a three-dimensional obstacle course faster than a human-piloted drone for a competition they are calling the AlphaPilot Innovation Challenge. The contest will start accepting entrants in November, with the goal of racing an autonomous drone head-to-head with one of DRL’s best pilots in a televised event next year. DRL chief executive Nicholas Horbaczewski said the goal is to develop a “crucible of competition” for the software behind self-piloting drones. “This is really a challenge to encourage a new generation of researchers in autonomy . . . to give them a framework in which to compete and push the boundaries of what’s possible,” he said. Drone Racing League was founded in 2015 to formalize a patchwork of racing groups that were already using drones in fields and parking lots around the world. Its first two seasons notched tens of millions of viewers, according to one report, and its third season began last Thursday night on ESPN2. The pilots themselves are a devoted group of drone enthusiasts who are trying to transform the sport from an amateurish game into something resembling a professional sport, competing with each other to navigate their drones through DRL’s intricate obstacle courses. They steer the drones remotely using virtual reality goggles. For Lockheed, the marketing stunt comes as the Pentagon is looking for ways to use robotics and artificial intelligence in military operations. Defense contractors view military artificial intelligence technology as a promising emerging market, and they are competing fiercely for early opportunities. Lockheed recently lost out to rival Boeing for an initial foot in the door to build the Navy’s MQ-25 Stingray, an autonomous refueling aircraft that is expected to become a $7 billion program. And in early May the Pentagon crossed a key milestone in a program to launch and recover small drones from larger planes, turning to an Alabama-based company Dynetics to coordinate the complex engineering challenge. Not all of the Defense Department’s artificial intelligence initiatives directly involve weaponry. The Army is using artificial intelligence algorithms to spot failing tank parts before the vehicles break down in combat, for example, partnering with a Chicago-based start-up called Uptake. Lockheed is the primary contractor for NASA’s InSight spacecraft, which in early May began an unmanned mission to explore Mars. It has employed autonomous navigation systems to F-16 fighter planes, built autonomous driving kits for use in Army vehicles and has invested in self-piloting submarines. Manned fighter jets like the F-35 Joint Strike Fighter are still the company’s biggest source of business by far. The U.S. military’s drone programs have been dominated by San Diego-based General Atomics, which makes the MQ-9 Reaper. Lockheed’s foray into drone racing can be seen as part of a broader rebranding effort being undertaken by the Washington defense establishment, as legacy defense firms present themselves as something other than lumbering, bureaucratic creatures of government. Lockheed has been pumping resources into such efforts, recently lending $100 million to its own technology venture investment fund. “We are really at our heart a high-technology company,” said Robie Samanta Roy, vice president of tech strategy at Lockheed Martin. That shift is driven by the changing face of innovation in the 21st century. Advances in artificial intelligence are increasingly coming from Silicon Valley tech firms such as Google as opposed to government research labs. That cultural difference has occasionally been a source of friction. In early June, Google chief executive Sundar Pichai announced in a blog post that the company would refrain from developing any artificial intelligence that is used in weaponry, after being pressured by employees over the company’s military drone work. As they embark on their new partnership, Drone Racing League and Lockheed Martin say they are focused purely on sport. But Lockheed executives say they view the competition as a key recruitment opportunity for national security-oriented efforts.